Organized labor is under attack. In 2011, in the depths of an icy Midwestern winter, roughly 100,000 Wisconsinites descended upon their state capitol. Just one month into his term, Governor Scott Walker’s ultimately successful attempt to strip state workers of labor rights provided the rallying cry. His unassumingly titled Wisconsin Budget Repair Bill sought to buoy the state budget by restricting collective bargaining and changing union membership rules. While Walker’s bill did reduce the state deficit, it did so like a chemotherapy drug gone wrong. Since its passage, the Wisconsin Budget Repair Bill has devastated public sector unions, with some unions hemorrhaging up to two-thirds of their members.1 The Act also proved to be the patient zero for conservatives across the United States seeking to reinvigorate America’s union-busting movement. Just one year after its passage, Michigan and Indiana enacted more sweeping and speciously named “right-to-work” policies extending to both public and private sectors. While much of the debate focused on economic issues and low wages, many on both sides of the issue are missing the critical health dimension of outlawing public sector unions. Conservatives in Oregon, Missouri, and Ohio are agitating to follow in Walker’s footsteps, while Senators Mitch McConnell and Rand Paul are making efforts to kick the door open nationally on this issue.2,3 In the shadow of a historic year for American health care, they would do well to heed the effect of right-to-work policies on the health of American workers. Before this underappreciated consequence is examined, it is worth covering the basics of right-to-work legislation. Unions represent all employees in workplaces they organize, not just those who pay dues. As a result, federal law permits contracts that, as a condition of employment, require all workers to pay membership dues. The requirement ensures unions are adequately resourced to represent the interests of workers during collective bargaining. Right-to-work laws make these membership agreements illegal. When they do, unions become subject to a phenomenon known to any economics student—a prisoner’s dilemma. When not compelled to pay union dues, many will be tempted to withhold their contribution. This leaves unions in a bind. While they are duty-bound to represent everyone in the workplace, they are unable to collect dues from the entire workforce. They have fewer resources available to protect the health and safety workers and are at risk of being hollowed out. At present, right-to-work laws are on the books in twenty-four states and apply to both the public and private sector. Though Wisconsin served as a flash point in battle, Governor Walker only changed legislation for public sector unions. Nonetheless, Wisconsin’s decimation of public sector unions provides a lesson for future combatants in this fight. To see where we’re going, it’s instructive to see where we’ve been. Approving its constitution in 1890, the United Mine Workers of America is one of the oldest unions in the United States. As part of the broader labor movement, it secured an eight-hour workday and retirement benefits.4 Despite these victories (or perhaps because of them), some commentators dismiss unions as relics from a different age. Yet even in contemporary America, these so-called old-world unions play a critical role in ensuring worker safety. Alison Morantz, a Stanford Law School professor, examined the relationship between unionization and coal mine safety from 1993 to 2010. Using historical data from the Mine Safety and Health Administration, Morantz found that unionization predicted a substantial and significant decline in fatalities and traumatic injuries. For traumatic injuries, this difference ranged from 13 to 30 percent, while 28 to 83 percent fewer fatalities occurred.5 If unionization were a prescription medication and Pfizer got its hands on this data, you can bet you would hear “talk to your doctor about unionization” in every timeout during Monday night football. Interestingly, Morantz also reported that unionized mines had a higher number of injuries—a phenomenon she credits to more stringent injury reporting practices in union versus non-union mines. As a result of the study, workers approached management with confidence and discussed their grievances with credibility. In 1999, the union brought this data to the bargaining table and began citywide hotel negotiations. The hotel wrote a reduced maximum workload—from fifteen to fourteen rooms—into the new contract, and the union also won commitments for future health and safety studies for food servers, kitchen workers, and others employed in the hotel. Both of these cases are exemplars of what unions do for their membership. While it is important to celebrate them, it is also important to recognize that the labor movement is not without its problems. Conservatives from think tanks like the Heritage Foundation take special pleasure in highlighting cases of union corruption and examples of union bosses who are bullies. But to use these examples to justify a systematic dismantling of organized labor is akin to removing a quarter-inch skin cancer by amputating an entire limb. In states where right-to-work laws have performed such radical surgery, the implications for worker health are not just theoretical. Michigan economist Roland Zullo focused on America’s construction industry to dig deeper into this connection. From 2001 to 2009, Zullo examined the construction industry and its occupation fatality rates from fifty states and the District of Columbia. In states with right-to- work laws, workplaces suffered from low rates of union density, meaning fewer workers belonged to unions. In the landmark achievements of old labor and the emerging ones in new labor, it is worth considering what the universe of possibilities may have been in an environment of more ubiquitous right-to-work legislation. Would San Francisco’s hotel workers have been appropriately resourced to notice an abnormally high rate of workplace injuries, commission a study with UC-Berkeley, and ensure safer work environments for their colleagues and successors? To what extent would American coal miners be protected from deadly working environments if not for the United Mine Workers of America? As the momentum builds to take apart the legislative scaffolding that served to protect the health of America’s workers, the relevance of unions to worker well-being is still a question worth considering. Danyaal Raza is a family physician, Frank Knox Fellow, and Master of Public Health Candidate at the Harvard School of Public Health. Upon graduation, he will resume practice in primary care with a renewed focus on social and economic determinants of health. 1 Bice, Daniel. 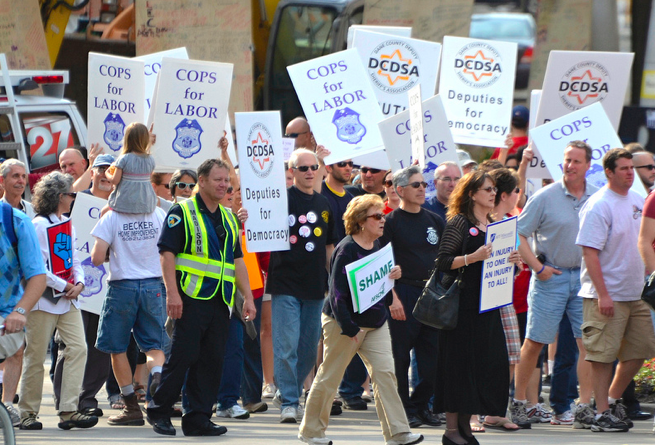 “Membership in Public Worker Unions Takes a Hit Under Act 10.” Milwaukee Wisconsin Journal Sentinel, 20 July 2013. 2 Associated Press. “’Right-to- Work’ Push to Target Oregon.” HeraldNet, 19 December 2013. 3 Jamieson, David. “Mitch McConnell, Rand Paul Hope to Tack Right- to-Work Law onto Employment Non-Discrimination Act.” Huffington Post, 5 November 2013. 4 United Mine Workers of America Web site. UMWA History. 5 Morantz, Alison D. “Coal Mining Safety: Do Unions Make a Differ- ence?” Industrial and Labor Relations Review 66(1), 2013. 6 Yue, Lorene. “Starbucks Workers in Logan Square Form Union.” Crain’s Chicago Business, 30 August 2006. 7 UNITE HERE Local 2 Web site. Meet our Members. 8 Tau Lee, Pam et al. “Participatory Action Research with Hotel Room Cleaners in San Francisco and Las Vegas” in Community-Based Participatory Research for Health, eds. Meredith Minkler and Nina Wallerstein. Jossey-Bass, 2008, 335-353. 10 Zullo, Richard. Right-to-Work Laws and Fatalities in Construction. Institute for Research on Labor, Employment, and the Economy, University of Michigan, March 2011. 11 Hirsch, Barry, and David Macpherson. Union Membership and Coverage Database from the CPS. 2014. 12 AFL-CIO. Death on the Job: The Toll of Neglect. AFL-CIO, April 2013.
of Nonfatal Occupational Injuries.” Journal of Occupational and Environmental Medicine 46(1), January 2004. 14 Boden, Leslie I., and Al Ozonoff. “Capture-Recapture Estimates of Nonfatal Workplace Injuries and Illnesses.” Annals of Epidemiology 18(6): 500-506, June 2008. 15 Hidden Tragedy: Underreporting of Workplace Injuries and Illnesses. Hearing before the Committee on Education and Labor, U.S. House of Representatives, 19 June 2008. 16 AFL-CIO, Death on the Job.